Most of us are very enthusiastic when it comes to developing technology and how it can benefit our lives, whether that’s at home or in the workplace. Technology designed to enhance our work lives can be hugely beneficial, and we’ve certainly seen clear developments and trends over the last few years, including collaborative work spaces. Productivity in the workforce is of concern to employees on any level, whether they are the CEO, manager or any other role. Technology can be designed and implemented to improve productivity and make our lives easier in terms of completing daily tasks. The Microsoft Surface Hub is one such piece of technology that can do wonders for the efficiency of your staff. The capabilities that the Surface Hub can equip your staff with are priceless, ensuring that everyone is making full use of their potential. 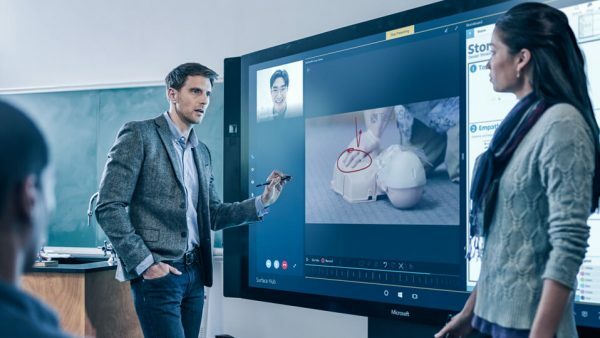 The Microsoft Surface Hub is a collaborative, interactive platform that allows you to not only participate in video conferencing, but also to create and share documents. Thanks to this, your workforce can cooperate in a much more engaging environment, bringing creative ideas to the table and watching them unfold right before you. The beauty of technology, such as the Microsoft Surface Hub, is that it provides your team with the right tools to work together in an efficient manner. Streamlining your workforce and bringing colleagues closer to share documents and set up video meetings has never been so easy, thanks to modern developments. The Surface Hub has reinvented the way we carry out our meetings, whether that’s with your team or even your clients. Creating a new meeting room experience in your workplace, you are able to communicate and debate on your next set of projects efficiently. Through large-screen apps and the ability to share your ideas on an interactive screen can bring teams together, no matter what industry you work in. One of the bigger issues with collaborative technology has been the isolation of operating systems. Someone who uses a Cisco system might not be able to communicate with someone who uses a different video conferencing product, and vice versa. This, of course, is a huge problem when trying to optimise productivity. Thanks to Microsoft Surface Hub, you can seamlessly achieve interoperability, so that no matter what device you’re using, you can tap into its services. 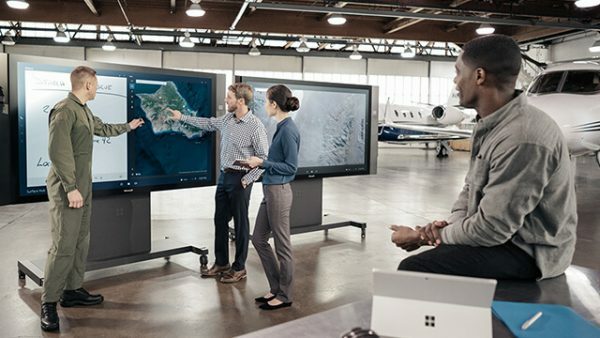 By integrating Microsoft Surface Hub into your existing system, you can move on from seemingly old-school phone calls and reach a new standard of video communication. Connect from any end point and be able to collaborate with teammates or clients to reach a modern, technology-driven environment. Giving you the ability to communicate as naturally as possible with those around the world, ‘work’ now becomes an activity instead of a place, allowing you to obtain productivity through flexible environments. Collaborative technology has now moved on from something that benefits boardrooms and executives, to something that can be used by everyone at any level. Interoperability makes this not just a possibility, but a reality. To implement Microsoft Surface Hub or other collaboration technology into your workplace, contact Viju.